The Track Trailer® MC2 Asymmetric Link chassis and suspension (MC2 Suspension® for short) system was the result of experience and the insights it brings and the necessity to innovate or fail. 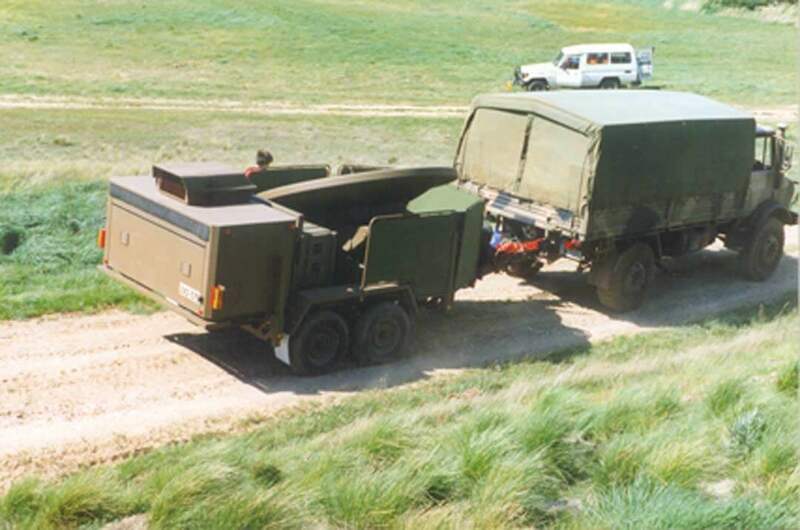 In 1995 Track Trailer® was invited to tender for the supply of trailers to the Australian Military. The specification required a 16inch wheeled trailer to go where a Unimog goes and come back without damage! This meant the chassis and suspension not only had to be robust, it had to have substantially more wheel travel than was available with any of the conventionally available systems. Track Trailer® developed its MC2 Suspension® system from a “clean sheet of paper” to ensure it not only met the required specification but also took advantage of its potential to minimise the need for service and maximise the ease of controllability of the tow vehicle – trailer combination on rough terrain. Its distinctive trademark asymmetric links are another example of form following function and will no doubt be imitated, but the innovation that created them and applied them can not be copied easily nor can the track record be granted to imitators. Due to the hostile environments in which Track Trailer® products operate it is imperative that all products are manufactured and designed to the highest possible standards of performance. This means that all product modifications undergo rigorous testing before implementation especially suspension modifications. Track Trailer® MC2 Suspension® system is routinely customised to allow the trailer’s wheels and tyres to be matched to the client’s tow vehicle. This ensures the best security for the traveller in remote locations and has proven a popular feature. The chassis itself is a combination of some continuing long standing Track Trailer® practices such as hot dip galvanizing, which Track Trailer® started in the late 1980s and applying some sound principles learned from the design of truck and 4×4 chassis such as the use of torque tubes, welded on both flanges of chassis members. Properly engineered draw bars with precise jigs and rigorous quality control in assembly and welding, ultimately produces a chassis that is as light as it is robust and reliable. With its wheel travel, self steering geometry, spring and shock absorber rates calibrated to each application, our MC2 Suspension® system has been used in varied applications from small gear carrying trailers through to massive Mine Warfare Satellite Earth Stations. This is the only suspension system available in the recreational market that’s currently being utilised by the military. Quite simply it is reliable, robust, proven and effective.